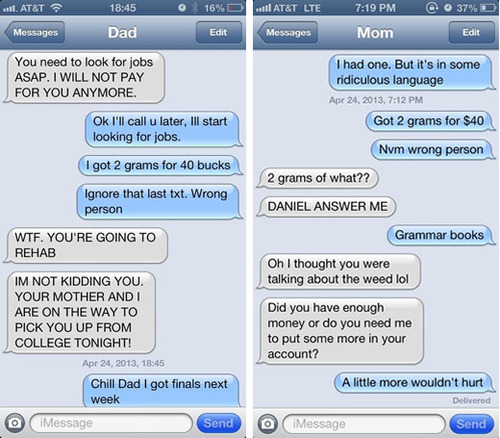 If you’re one of the parents who received a text that said “got 2 grams for $40” followed by a text that said “Sorry, ignore that txt. Not for you,” have no fear. It just may mean your kid is a fan of comedian Nathan Fielder. Still paranoid? Well, comfort yourself with the knowledge that the Swedes have come up with a way to breathalyze for pot, coke, meth and pills. The only rub? Apparently the machine’s not so good on benzos. People don’t often buy grams of Xanax, though. If that doesn’t bring you much relief, why not remind yourself that you’re not the ex of Mike Tyson’s who made a meal out of one of his pigeons.